Notice that it’s doing something cool: after you’ve typed in the first zip code, you can type in more zip codes and it will draw multiple zip codes at once. Q: Where can I get a database or directory of all ZIP Codes and/or ZIP+4 codes along with the corresponding city, state, county, etc.? Is there an FTP site for downloading? A: The information you are seeking is not available via download but is provided through our National Customer Support Center at (800) 238-3150 …. [and then later] The Postal Service does not maintain any ZIP Code maps. The only related product we have at this time is the TIGER/ZIP+4 File. And “TIGER/ZIP+4 File” is a link to a 404 page. Oy, thanks a lot! Grrr. Okay, so pop on over to the U.S. Census Bureau. For example, this page has a link to many good resources, including http://www.census.gov/tiger/tms/gazetteer/zips.txt which has a list of zip codes along with the city, state, latitude, and longitude of each zip code (the lat/lon is for the zip code center). This new entity was developed to overcome the difficulties in precisely defining the land area covered by each ZIP Code. For example, zip codes represent postal routes and can’t always be represented with polygons. You can almost feel the contempt seething from the Census Bureau toward the U.S. Postal Service. I can believe that when Census and Postal personnel get in the same room, arguments break out and tempers flare. Sort of like Herbert Kornfeld, the Accounts Receivable Supervisor at The Onion that is always rumbling with Accounts Payable. Okay, where were we? Postal Service: not helpful at all. Census Bureau: a great, easy-to-parse file. Okay, how about the boundary info with the shape of a zip code/ZCTA? How about this: http://www.census.gov/geo/www/cob/zt_metadata.html Oh, snap! Census Bureau 2, Postal Service 0! Shall we delve a little deeper? Let’s do it; zip codes are fun. By the way, if you’re not a complete and utter nerd, or you don’t have hours to kill digging into files, the huge.info site sells a DVD with cleaner data in an easier format. set title "Zip code: 94043"
Update: If you enjoy playing with zip codes, Gary Price pointed me to http://www.melissadata.com/Lookups/index.htm where you can look up neat things like demographics and business counts. Strangely enough, I was just looking for zipcode to town, state and back information. zips.txt file is neat, unfortunately outdated at least 5 years. It’s missing “new” zipcodes from both places I happened to live in in the last couple of years (both East and West coast). Makes one wonder how often they shuffle zipcodes around. Much of this has been done before. I emailed Research Buzz as well, but in case you have not done multiple requests, it kicks you off after several requests (not sure how many- was not counting) and tells you to come back in 2 hours. It may be doing this via the IP since I cleared cache, cookies, history, etc and still received the same message. The MAPS API is very cool. Does anyone know if there is a way to zoom in and only display the zip code and then map a specific address? When will this technology be extended into the UK? We are real interested in using this for an upcoming project thats in development stage at the moment. Sorry I forgot to add to above that will this also be available for commercial use that can be implemented into projects for www and mobile web? Great stuff. Maps is such a cool app that I am brainstorming for a use on our web site. ever recognized that “zip-code”, “zip code” and “zipcode” differs in google? Totally fascinating now I need some time to play. Now if Google could just build me a widget that would increase my time by 100%!!!. > Makes one wonder how often they shuffle zipcodes around. Quite a lot, actually. I do some work with mail-list management and see evidence of this all the time. Actually, though the source escapes me at the moment, there IS somewhere with the USPS where you can get updated zip databases every month. anyone seen an example of mapping county bounderies using google map. Or should i be asking how would you go about mapping the borders of a county via google maps. In actual practice, I’ve found that the lon/lat data from the census site (gazateer) is not very accurate. For a commerical application, you’d need better data. I have a question for you. Can you please read this group post then reply? I recently added both city/town and county boundary mapping to the application. Nice–thanks for mentioning that, John! I love plotting town boundaries.. This is very cool software. I don’t think I have ever seen any kind of software draw out the area that a zipcode falls within. Pretty cool stuff. I have just found great Google Maps site similar to this, but with whole world coverage. Maybe interesting for others as well. See http://www.maplandia.com. Had been playing with the tigerline database and and the geocoding and i think having it natively in your system seems costly than using the geocode us webservice. I have a list of zip codes that I want to display on Google Map (eg, with a marker – I’m not trying to show boundaries). I’d like to show them all at once, not one at a time – have you seen a site that does htis? I know this is somewhat unrelated to this thread, but I was curious as to why some addresses like this example show up as a different address when mapped by Google. I found it odd and thought there must be an explanation???? Does anyone know if there is something simalar for Canada? I wish they made smoething like this to the UK!! When does this tool will be available for another countries? multi-country zip codes would be helpfull for us as well. If anyone finds one please post. 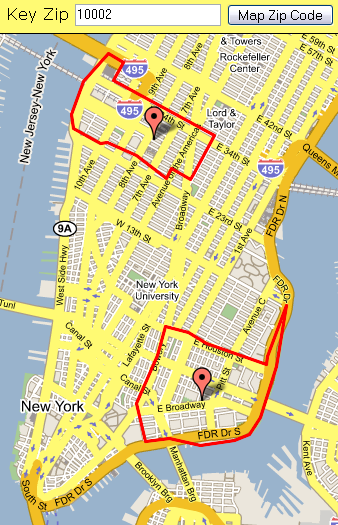 Hopefully it will be useful for companies who want ZIP Code outlines in their web applications. Man I wish this was available in Australia. That is such a cool tool to have especially for working out freight charges for distribution. I have a list of zip codes and I want to show their concentration on a map, kind of like a precipitation weather map. How do I do that? I searched the regional term ‘Virginia Web Design’ and you displayed the regional results incorrectly. You show map tag ‘C’ as Ciniva but this should be VISIONEFX. The same thing happens when you search the local term ‘ Virginia Beach Web Design. You show map tag ‘A’ as Ciniva but this should be VISIONEFX. Why are the map tags inaccurate? Most of them have databases with latitude and longitude coordinates included. That’s a cool. I didn’t realize zip codes were so irregular shaped and weird looking. Check out my zip code 90211 and the craxy shaped LA zip codes arount it. I have built a set of tools to work on zip codes. Take a look at http://www.mapszipcode.com. The site is complete but I intend on adding more tools and info as time permits. This is very fun and a great application of map data with Google. Important to remind anyone doing serious analysis though, that ZCTAs are very much not “ZIP Codes”. Commercial companies (like Maponics – http://www.maponics.com – where I work) use much more accurate and current data than ZCTAs. Of course, ZIP Codes are not really polygons anyway – they are collections of houses that have the same ZIP Code, but that’s a whole other story. I was just looking for this exact tool for a blog idea I have. Managed to find this post in 10 minutes. I love the web. Does anyone know of a tool that would let you enter a primary zip code and then load up a 2nd list of multiple zip codes so that you can plot them on a state, regional or US map? You can get the free monthly updates ZIP code database from the following URL. It does not have the boundary information as mentioned by Matt earlier. However, the ZIP code list is good for validation purpose. Nothing wrong to give it a try as it is FREE. Like Amber, I need the ability to save these (3 or 5 digit) zip code boundaries to “My Maps” in google, to track our marketing campaigns. Does anyone know if this is possible or available? Thanks for the census zip code link! Made my day! Definitely helps with my shipping! Thanks for the post! 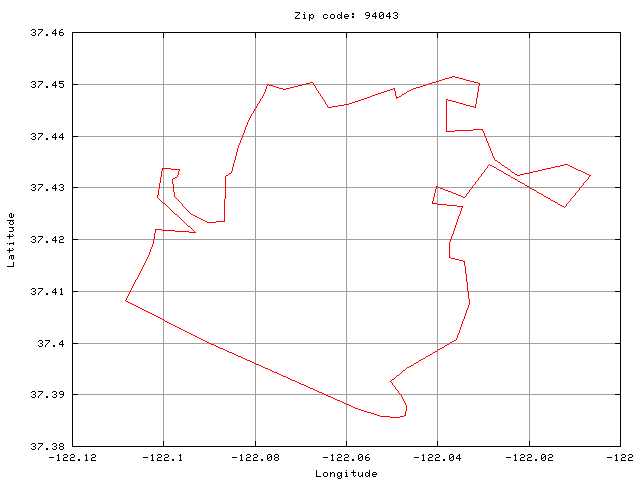 Anyone have an idea how to combine multiple contiguous zip codes and plot an outline of the combined area >? I was looking for a site to map a bunch of addresses/zipcodes onto a Google map and found this thread. A great service with highly editable output. Exactly what I was looking for. The USPS offers the AMS API CD as an alternative, which has all the addressing needs on it that would have been provided through the Address API. The Address Matching System Application Programming Interface is $3,800/ annually for in-house use. This allows the customer to place the data in one location on one server and develop on one platform. If wish to develop on multiple platforms or develop software for resale, there are additional charges. They have an online API but you need to be a USPS shipping customer using it for that purpose in order to get the API account authorized. Oh well. There are other ways to get at the data.